To Say “Thank You” or NOT: Whether walking or driving, there are inevitably going to be people around to help. At our current school, we have lots of chances to say thank you. There are kids assigned to help open car doors — say thank you to them! There are kids assigned to hold open the door to the school — say thank you to them! I am amazed at the numbers of children and adults who walk right past these kids as if they don’t even exist. Not a smile, not a hi, not a thank you. When we walk to school, I make sure to say “thank you” to the crossing guard every single time. Trust me, your kids will pick up on it and start to follow your example. So, don’t let the helpers be invisible; make sure you acknowledge them. To be Courteous of Others or NOT: This is the hardest skill to teach kids and adults have a hard time with it, too. We are so focused on ourselves and what is going on in our own little world. But when there are a lot of people around, like bumper to bumper cars or crowds of people all walking on the side walk at the same time, it is so important to focus on what’s going on around you. We can teach our kids to move to the side instead of taking up the entire sidewalk when there are others who need to get around. Your kids will notice if you allow someone else to pull out of a parking spot first or to merge in front of you. And when they ask why you’re waiting, you can explain about watching for others and being courteous. To Follow the Rules or NOT: This has been a big one for us over the years and one my kids always question. Why can’t we do __________ like they’re doing; it would be faster, or more convenient, or more fun, or whatever. There will always be rule breakers and the more we teach our kids to follow the rules in the simple things, the better off they will be later in life when it comes time to do grown up things when some people still break the rules and it will be tempting to follow. It’s much better to just always teach them to follow the rules, all the time and even in the simple things. How to Do Hard Things or NOT: After a long, hard day at school, when we have to walk home, sometimes it is hard. 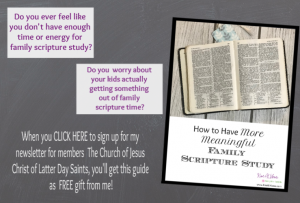 At the very beginning, my kids felt like I should be their personal pack mule. But with 4 kids in elementary school, I was NOT going to be carrying all their lunch boxes and backpacks. So, it was easy to set this boundary from the beginning. In all honesty, their backpacks are very light, a folder or two and a few papers and it is not a struggle for them to carry them. So, on the occasion that they start to whine about it, I like to remind them that they can do hard things. I love that they get opportunities to prove to themselves that they can be independent. They can carry their own things and don’t need Mom to do it. To Enjoy Time Together or NOT: I still have my youngest at home with me and on the days that we do pickup in the car, it can be a long wait in the car, trying to get to the front of the line. We may sing a long to some music or use the time to talk (she’ll ask mounds of questions and I do my best to answer!). We might bring along an activity to do, like working on letter recognition or reading a story. Sometimes we just look out the window and enjoy the peace before all the crazies load up in the car with us! And while it won’t always be perfect, the point is that our attitude can go a long way in having a positive experience, at least most of the time. I think the most important thing to remember when you have kids is that you ALWAYS have little eyes and ears watching and listening to what you are doing. Whether we are meaning to teach them or not, we ARE teaching them . . . with our actions, all the time. 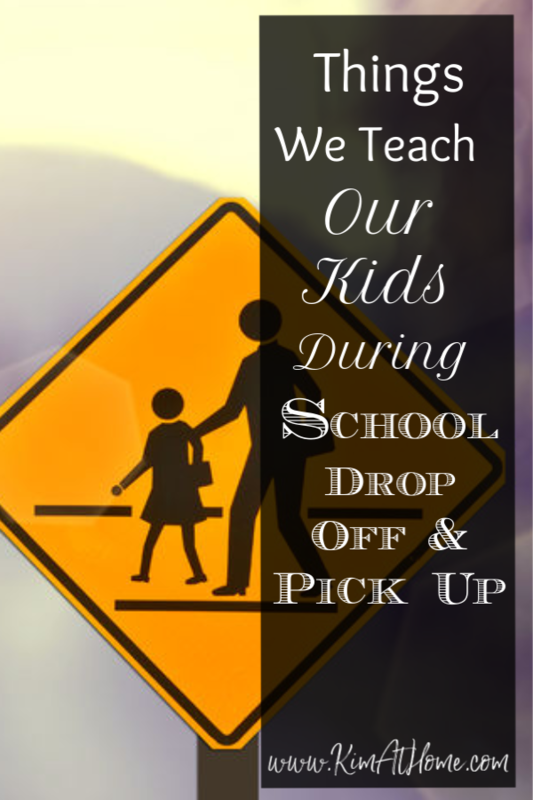 And if we are more intentional with our actions and what kind of example we’re setting, we can teach some great things in ordinary moments, like school drop off and pick up.